Who cares if your kid is an honor roll student? This guy's kid is an awesome gamer! If you've ever spent any time in the suburbs, odds are that you've seen a number bumper stickers announcing someone's kid is an honor student at whatever school they attend. When I was growing up, if you got caught riding in a car with one of those things on it, you got the stuffing knocked out of you by the local bullies. However, a California artist is rebelling against the trend by creating bumper stickers that any gamer parent would proudly slap on their vehicles and would probably help their kids make friends. The stickers, two of which are seen here, were created by Das Chupa, an artist who seems to specialize in comic and videogame satire. According to Chupa, "My son Dean is going to be out of beta in just over 3 months and I've got some preparing to do. I've never understood why parent [sic] stick the crap bumper stickers about their six year olds making the honor list in a grade where bladder control is part of the curriculum. So I decided to make some stickers that I would be proud to brag about to the world. And since my child will grow up playing games that build character (and OCD) they would look like this." Chupa currently has two posts on his blog dedicated to these bumper stickers. 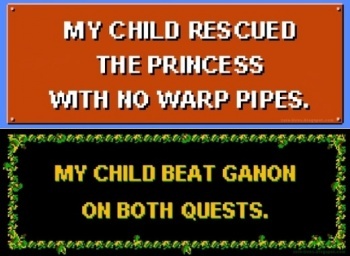 I think my favorite one so far is the original NES Ninja Turtles one that claims "My Child Defused All The Bombs!" Hopefully he'll create some more in the near future.